Here is my card, made with Kiss a Prince Tia and colored up with copics. I went with a lot of purple as I think that is supposed to be a royal color...? Added some green and a touch of yellow to go with her crown and trim on her dress. I totally LOVE that frog, he's so cute! I added a tiny pearl as an earring and a button on her vest. 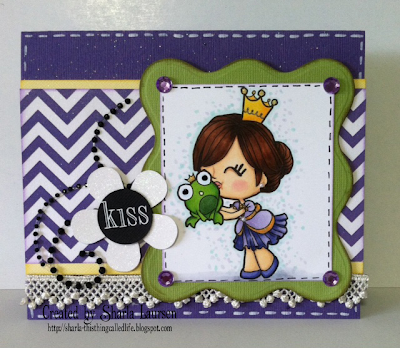 Gems on the corners and used a spellbinder wavy rectangle die cut. The flower is a punch, as is the center and "kiss" is rub on letters. I used some lace trim, bling and white line work. I love how it turned out and hope you do too. Please come check out the rest of the DT projects, there is seriously some talented girls over there and join the challenge, it's for the whole month, so plenty of time to enter! Monday I will be back with a project using SOG's new clear release. The image I got to work with is super cute, don't forget to come back to check it out! awesome job and congrats on the guest! glad you are joining us!! Oh My! What a sweetie this image is...GOrgeous colours and I LOve your design..Thank you sooo much for joining us this week at Tammy's Scrapin Corner. Oh so cute Sharla!! Love this image. Great coloring and the paper fits well with the image and theme. SO nice to see you representing SOG this month Sharla, you do lovely work!! Big congrats on being SOG GDT and amazingly gorgeous card!!! This is a wonderful creation with great details and its perfect for our ‘Use A Digi’ challenge. Thanks for sharing your talent with us. Good luck. im loving your cards, im going to lift these sketch's today!